Boy, if you thought you were having a bad day, I can guarantee it's nothing compared to what happens to a group of New Mexico citizens on the CW's upcoming sci-fi thriller The Messengers. Several of them bit the metaphorical dust once an unidentified object crashes into Earth and releases a deadly shock wave. Of course, everyone ends up coming back to life with mysterious new life goals, but still. That whole getting killed unexpectedly thing has to take a mental toll, right? 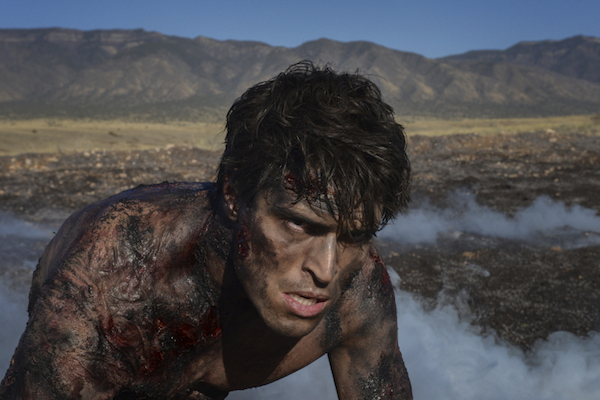 The Messengers is one of two new series coming to CW during Midseason 2015, and we got our first peek at the creepiness earlier this week in the form of the image below. You might think The Messengers, executive produced by Trey Callaway and Basil Iwankyk, is solely about one man's quest to be as filthy as humanly possible, but the mysteries go much deeper than that. Discover more about the show in the official synopsis below. In the white-hot sun of the New Mexico desert, scientist Vera Ivanov watches in fascination as a mysterious object plummets to Earth and explodes in a blinding flash, sending out a shock wave that briefly stops her heart. But Vera is not the only one affected by the blast: she is instantly and mysteriously connected to four other strangers, who also collapse only to miraculously come back to life hours later. Erin, a young mother desperate to protect her 7-year-old daughter from an abusive ex-husband; Peter, a troubled high school student who finally lashes out to end the constant bullying he can no longer endure; Raul, a federal agent looking to escape his undercover assignment in a violent Mexican drug cartel; and Joshua, Jr., a charismatic second-generation televangelist following in his father’s footsteps – all awaken after the pulse with powers they can barely believe, from inexplicable strength to the ability to heal others. Most mysterious of all is the figure known only as The Man, who offers Vera the one thing she wants most in life – to be reunited with her kidnapped son – if she will help him with one morally complicated task. That task puts Vera on a collision course with nurse Rose Arvale who, after a seemingly random act of violence left her in a coma for seven years, suddenly begins to stir. As Joshua, Jr. prophesizes, the wheels of Revelation have begun to turn, and this group of strangers might be the only hope for preventing the impending Rapture…or causing it. Because it can't all be survival and comas, here's another early still, this time of One Tree Hill's Shantel VanSanten as Vera, just calmly enjoying a breeze. Get ready for your own pulse to quicken when The CW airs The Messengers during Midseason 2015. See the CW's full 2014-2015 lineup here.